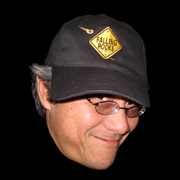 About Me: My name is Gary Fujihara from Hilo on the Big Island of Hawaii, I am the owner of Big Kahuna Meteorites and also head the office of Science Education and Public Outreach at the University of Hawaii Institute for Astronomy. I am a graphic artist, musician, photographer, software engineer, avid meteorite collector and rabid obsessive compulsive about it. My official work consists of communicating the science of astronomy to the public in general and to young students K-12 and undergraduates in particular. In the course of my work, I have founded the AstroDay Festival, one of the largest astronomy day events in the world, and recipient of multiple national awards. My non-profit organization has also established scholastic robotics teacher training workshops and programs in schools and community centers throughout Hawaii Island since 2004. I have developed a science inquiry activity using real meteorites that targets several Hawaii Content Performance Standards and Benchmarks in mathematics and science. My focus has been on informal science education and hope to bring that body of knowledge and experience to the IMCA Board. I have also served my community through membership and on the Board of Directors for Rotary Club, Chambers of Commerce, Economic Development Boards, and civic clubs, so I have experience in organizations like the IMCA. I believe that maintaining the authenticity and integrity of meteorites that exist in the collector communities are of the utmost importance, and ask that you give great consideration in selecting the best qualified candidates for the positions of Director in this fine organization, whether that would be me or any of the excellent candidates. But please VOTE, because that is the most important obligation you have to maintain the integrity of this organization.